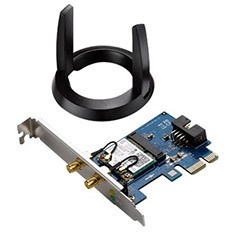 The ASUS PCE-AC55BT Wireless-AC PCI Express Adapter provides superior Wi-Fi performance for server backbone and switching infrastructure applications, as well as mainstream desktops and notebooks. Using the convenience of a standard PCI Express connector, it delivers wide compatibility, fitting any x1, x2, x8, or x16 slot. Compared with standard PCI network cards, it offers increased bandwidth, reliability and functionality, allowing you to enjoy faster and more stable connections.